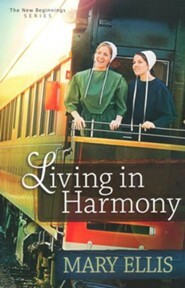 Living in Harmony is the first book in bestselling author Mary Ellis's New Beginnings series. It's about fresh starts and love and how faith in God and His perfect plan for our lives provides us with the peace and joy we desire. Amy King young, engaged, and Amish faces difficult challenges in her life when she suddenly loses both of her parents in a house fire. Her fiance, John Detweiler, persuades her and her sister Nora to leave Lancaster County and make a new beginning with him in Harmony, Maine, where he has relatives who can help the women in their time of need. I'm the author/artist and I want to review Living in Harmony - eBook.